When Ferdinand Magellan sailed into Guam in the early part of the 16th century, a cultural misunderstanding between him and the local Chamorro people led him to name the island the Island of Thieves. The story of the Chamorro people from this early failed contact is a sad one, as the Chamorros' numbers dwindled through fighting and disease. There are no pure Chamorros anymore; modern-day Guam is a Westernized US territory armed with fast food chains, expensive hotels and a collection of popular beaches, reefs and surfing spots. In short, it's a bit like a small-scale version of Hawaii. Like all good tourist destinations, though, Guam still shows an active interest in Chamorro culture. An attractive Chamorro Cultural Village displays traditional Chamorro arts and craft; and a strong push towards restoring towns and villages with their Chamorro names reveals a genuine desire to pay homage to the people who've inhabited this small nook of the North Pacific for a century and a half. It is believed that Guam was first discovered by people from southeastern Indonesia around 2000 BC. Portuguese navigator Ferdinand Magellan, sailing for the King of Spain, reached the island in 1521 during his fleet's circumnavigation of the globe. General Miguel López de Legazpi claimed Guam for Spain in 1565. Spanish colonization commenced in 1668 with the arrival of Padre San Vitores, who established the first Catholic mission. The islands were part of the Spanish East Indies governed from the Philippines, which were in turn part of the Viceroyalty of New Spain based in Mexico City. Between 1668 and 1815, Guam was an important resting stop for the Spanish Manila galleons, a fleet that covered the Pacific trade route between Acapulco (Mexico) and Manila (Philippines). Guam, along with the rest of the Mariana and Caroline Islands, were treated as part of Spain's colony in the Philippines. The United States took control of the island in the 1898 Spanish-American War, as part of the Treaty of Paris. Guam came to serve as a station for American ships traveling to and from the Philippines, while the Northern Mariana Islands passed to Germany, and then Japan. During World War II, Guam was attacked and invaded by the armed forces of Japan on December 8, 1941. Guam's Japanese occupation lasted for approximately thirty-one months. The United States returned and fought the Battle of Guam on July 21, 1944, to recapture the island from Japanese military occupation. After the war, the Guam Organic Act of 1950, established Guam as an unincorporated organized territory of the United States, provided for the structure of the island's civilian government, and granted the people U.S. citizenship. However, to this day, though they are U.S. citizens, the people of Guam are not allowed to vote for president and their Congressional Representative is a non-voting member. This has caused contention amongst many Guamanians, who feel they are treated like third class citizens of the United States. Guam lies between 13.2°N and 13.7°N and between 144.6°E and 145.0°E, and has an area of 549 km2. It is the southernmost and largest island in the Mariana island chain and is also the largest island in Micronesia. This island chain was created by the colliding Pacific and Philippine Sea tectonic plates. Guam is the closest land mass to the Mariana Trench, a deep subduction zone, that lies beside the island chain to the east. Challenger Deep, the deepest surveyed point in the Oceans, is southwest of Guam at 10,911 metres deep. The highest point in Guam is Mount Lamlam at an elevation of 406 metres. The island of Guam is 48 kilometres long and 6 to 19 kilometres wide. The island experiences occasional earthquakes due to its location on the western edge of the Pacific Plate and near the Philippine Sea Plate. In recent years, earthquakes with epicenters near Guam have had magnitudes ranging from 5.0 to 8.7. Unlike the Anatahan volcano in the Northern Mariana Islands, Guam is not volcanically active. However, due to its proximity to Anatahan, vog (i.e., volcanic smog) does occasionally affect Guam. A coral table reef with deepwater channels surrounds most of Guam. Sandy beaches, rock cliff lines and mangroves characterize the coastline area. Sheer limestone coastal cliffs dominate the north, while the southern end of the island is mountainous, with lower hills in between. Northern Region - The Northern Region of Guam is comprised of large swaths of land controlled by the U.S. Military (primarily Anderson Air Force Base) toward the northernmost end of the island, and the villages of Dededo and Yigo just south of the military base. Dededo is the by far largest village on Guam, with a population exceeding 50,000. The Northern Region also contains Ritidian Beach, one of the most isolated, beautiful beaches in Guam. Central/Metropolitan Region - The Central Region holds the majority of Guam's villages and the island's international airport. A large number of shops, restaurants, and hotels are located in this area (primarily in the village of Tumon), and as such is the island's most visited area by tourists. It is also the region of the island most prone to heavy traffic congestion around rush hour. Southern Region - Guam's Southern Region is mostly rural and picturesque. It is one of the most untouched and undeveloped areas on the island and the Chamorro culture is most preserved here. Cocos Island and the black sand beaches at Talofofo are popular places to visit in this region. Ritidian Point is located at the northernmost point of Guam and is a national wildlife reserve. The site contains one of the most pristine and secluded white-sanded beaches of Guam and is perfect getaway for a few days. Try to visit during the week by the way, as on weekends there are families and some areas can get crowded. You will find yourself along during the week, except the local fishermen. Mount Lamlam is the highest point on the island of Guam at around 400 metres above sea level. Although it is rather a hill than a mountain, it is not an easy walk. Once you are at the top, the views are magnificent and you can see much of the island and the surrounding Pacific Ocean from here. Although Guam has some fine stretches of beach and there are areas you can be on your own, it still is rather crowded, especially with Americans. For some more tropical islands feelings, Cocos Island probably is a better option. Here, you can swim, fish, go snorkelling or sunbathing. Still, it's almost impossible to be really alone, as the island gets a fair share of tourists from the main island. Try to visit during the weekdays and come very early to have some hours of relative quietness. Umatac is an unspoilt village that is full of historical significance. Just before Magellan landed here in 1521 at the Umatac Bay, the Chamorros thought that a spot just north of Umatac was the place where the first people were created. This was celebrated annually and nowadays Magellan's landing is celebrated as well in the village each March. You can see his monument and the ruins of the Saint Dionicio Church opposite of eachother in the village centre. Off the beach and Umatac there is a Japanese Zero fighter plane in the bay, a good diving spot at 50 metres deep. Finally, Fort Nuestra Senora de la Soledad offers a stunning hilltop view of Umatac Bay. Micronesia’s longest-running and biggest volleyball event features more than just a tournament, but prize drawings, raffles and many other fun activities. The world’s top volleyball players come to Guam each February to compete for the large purse and glory. A national public holiday that is celebrated the first Monday of March, Discovery Day marks the finding of Guam in 1521. Malojloj Fiesta is one of the most popular festivals on the island. It is held in May, particularly in Inarajan. This three-day long event commemorates San Isidro, the patron saint, through traditional events, water buffalo racing and eating contests. There is usually a street party near the church where visitors are welcome to join in and try Chamorro beer and food. Guam celebrates Liberation Day on July 21 which commemorates their independence from Japanese occupation. Memorials and ceremonies are held the week before, while a parade on the day starts from Hagatna’s Marine Corps Drive. The Liberation Day Queen Pageant is a much-awaited highlight. Also known as Fishermen’s Festival, this event on August 12 is organized by the Guam Fishermen’s Cooperative Association and features educational and interactive displays about the fishing methods and the coastal environment of the island. Entertainment and fresh seafood are offered. This annual event celebrates the desserts and confections made by top chefs of Guam. Pastries in Paradise takes place in October and is organized by the Guam Hotel and Restaurant Association with sweets prepared on the spot. Guam has a pleasant tropical climate with generally warm and humid weather conditions. Average daytime temeratures hoover around 30 °C during the day, only January and February are slightly cooler. Night time temperatures are still above 20 °C during most nights and rarely drop below. The wet season roughly lasts from July to November with September and October seeing the most rain. Still, from December to June there can be heavy afternoon downpours as well. During the wet season, tropical storms can be a real danger as well but generally don't cause too much damage. Flights arrive at Won Pat International Airport. The main airlines is Continental Micronesia Airlines, a branch of Continental Airlines, serving American destinations like Honolulu, Los Angeles and Houston and other destinations like Manila as well. Guam is a major gateway to other places in the Pacific and as such there are many flights from many destinations in Asia, Australia and New Zealand as well. Airlines to choose from are All Nippon and Japan Airlines from destinations in Japan, like Tokyo and Osaka, China Airlines from for example Beijing, Philipiine Airlines from Manila and Korean Air from Seoul. Services from Australia include Continental Airlines from Cairns with possible connections to Micronesia. The same airlines also serves Hongkong and Bali. Yachts and the occasional cruiseship or cargoship are your only possibilities to get here. You can rent cars at the international airport or the capital and some hotels. Most roads are paved but can be slippery after rain. There is also a lot of traffic on the roads. Traffic drives on the right and you need an international driving permit, or if you are from the US, your national driver's licence will be sufficient. Cars start at about $50 a day. There are many bus lines on the island, but services are infrequent and confusing sometimes. Usually, transport is in small vans but some bigger buses drive the main lines. The entry requirements for Guam are largely the same as those for the U.S, and nationals of all countries not needing a visa to enter the U.S. do not need a visa to enter Guam, although they may require an ESTA travel authorization. Foreign citizens may enter Guam using one of three options: (1) the U.S. Visa Waiver Program, (2) the Guam/CNMI Visa Waiver Program or (3) a valid U.S. visa. If you are using the Guam/CNMI Visa Waiver Program, you do not need to apply for a travel authorization prior to going. The Guam/CNMI Visa Waiver Program includes seven U.S.-VWP countries (Australia, Brunei, Japan, New Zealand, South Korea, Singapore and the UK) plus Hong Kong, Malaysia, Nauru, Papua New Guinea, Taiwan and Russia(from 15.01.2012). Foreign citizens using the U.S.-VWP may stay 90 days, while citizens using the Guam/CNMI-VWP may stay for 45 days. Citizens of non-VWP countries must apply for a U.S. visa at any U.S. embassy. The US Dollar, or "greenback", is the national currency of Guam. One dollar consists of 100 cents. Frequently used coins are the penny (1¢), nickel (5¢), dime (10¢) and quarter (25¢). 50¢ and $1 coins also exist, but are rarely used. Frequently used banknotes are the $1, $5, $10 and $20 notes. $2, $50 and $100 notes can also be found, but are rarely used. The largest employers are the government of Guam and United Airlines, followed by a large duty-free retail firm (DFS Guam), the U.S. Federal Government, the hotel industry and services sectors. Guam has two large military bases and several smaller military installations that employ many people. The only U.S. Air Force base is Andersen Air Force Base on the northern tip of the island. The U.S. Navy has a large naval station - Naval Station Guam - located on the west-central part of the island near the village Agat. The University of Guam provides higher education opportunities for students on Guam, as well as providing higher education for much of Micronesia. The UOG is in Mangilao, on the central eastern side of Guam. Students can earn various undergraduate degrees and several programs offer degrees at the Masters level. Two of the better known Masters- level programs include the Environmental Science Program, focusing on Agricultural sciences through the College of Agriculture and Life Sciences (CALS) and Hydrology and Water Resources through the Water and Environmental Research Institute of the Western Pacific (WERI); and the Marine Laboratory, which focuses on Marine Biology and other environmental issues. English and Chamorro are the official languages of Guam. Persons employed in the tourist industry will typically have a working knowledge of Japanese. Despite its small population Guam has a range of restaurants, including Ya Mon's Jamaican Grill (locally owned & soon-to-be franchised), Hard Rock Cafe, Tony Romas and Chili's are in a building next the Guam Premier Outlets. Major hotels and restaurants serve continental meals and ethnic dishes. Fresh seafood is bountiful. Fresh fish, octopus, and crab are either grilled or baked with vegetables or fruit, sashimi, and in other ways unique to the Pacific. Travelers who venture further will find Chamorro, Japanese, Korean, Thai, Vietnamese, Filipino, Chinese, Mexican, and European restaurants, each with its own distinct ambiance. Chamorro Village offers a great variety of choices for local chamorro food, especially Wednesday nights. Of course, American fast food chains, such as Wendy's, Burger King, McDonald's, Taco Bell, Long John Silvers, Pizza Hut, Winchells Donuts and Dominos are common. Locals pride themselves in BBQ'ing and it is a frequent event in Guam. Families and friends often get together and for BBQs, so if you visit ask about BBQ's. It's a good chance you'll get invited! The main tourist area is around Tumon Bay, which has a number of high-rise hotels and resorts  similar to Waikiki Beach with an even larger percentage of Japanese tourists. Cheaper accommodations exist near the airport, especially around the village of Harmon. Be aware that Harmon hotels tend to be on the seedier side since Harmon is a mixed industrial/residential neighborhood. Many of the flights scheduled through Guam to other locations (especially in Asia) often require an overnight layover, so plan ahead. Some hotels offer airport pickup, as taxis can be quite expensive. There are no vaccinations legally required to travel to Guam. It's a good thing to get your vaccinations in order before travelling to Guam. The general vaccination against Diphtheria, Tetanus and Polio (DTP) is recommended. Also a hepatitis A vaccination is recommended and when travelling longer than 2 weeks also typhoid. Vaccination against hepatitis B and tuberculosis are also sometimes recommended for stays longer than 3 months. Dengue sometimes occurs as well. There is no vaccinations, so buy mosquito repellent (preferably with 50% DEET), and sleep under a net. Also wear long sleeves if possible. Observe caution when engaged in water activities on Guam, as in any coastal area, as currents can be swift and unpredictable, depending on the season. During the rainy season (from about August until March), water can pool unevenly on road surfaces. Pooling of rain water can lead to flooding of roads in the southern half of Guam, which does not have sewer drainage built under the road surfaces. Furthermore, many roads are in disrepair and potholes are frequent, which can easily blow out tires. Violent crime is fairly low, but property crime tends to be high, so safeguard valuables in vehicles. Rental cars have stickers and can be targeted by thieves. Guam is in a major earthquake zone, and these occur every few years. That said, there have been few casualties to date. The international telephone code is 671. Calls from North America into Guam, as well as those from Guam into North America should be dialed in the domestic format, while calls from elsewhere in the world into Guam should be prefixed by +1 671 prior to the 7-digit local number. 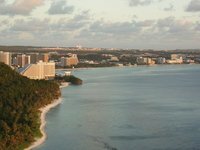 Use our map of places to stay in Guam to explore your accommodation options and to compare prices across the country at a glance. To narrow the results down by budget category, use the links below. This is version 29. Last edited at 11:50 on Jan 18, 17 by Utrecht. 48 articles link to this page.